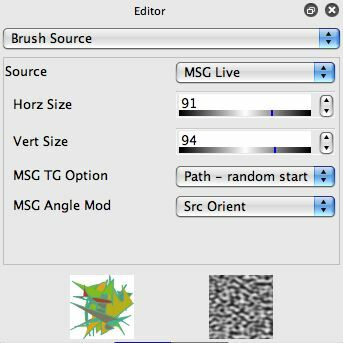 MSG Live is a new Source option in the paint synthesizer’s Brush Source control panel. This source brush option uses the current MSG preset to generate a source brush image buffer on the fly when drawing. Any MSG preset can be used to interactively generate the source brush, which means you can use Temporal Generators (TG) to modulate parameters in real time with either temporal oscillators or Wacom pen modulators like pressure or tilt while drawing. The MSG presets can be purely generative or can be source processing presets, which allows you to generate dynamic brush shapes on the fly from processing or modulating the local canvas or source areas the brush is passing over when drawing. MSG Live Source Brushes allow for an extensive range of custom interactive paint effects due to the modular nature of MSG presets. The factory presets that show off this new technique barely scratch the surface of the infinite range of possible paint effects you could generate with it. The screen snap above shows the Brush Source control panel for the Paint Synthesizer configured with the MSG Live Source option. Note that the source brush preview image at the bottom left of the Editor switches to show a MSG preview when editing a MSG Live Source Brush. You can edit the Horizontal and Vertical size of the source brush. Recall that the source brush sizing in the paint synthesizer is the maximum brush size. 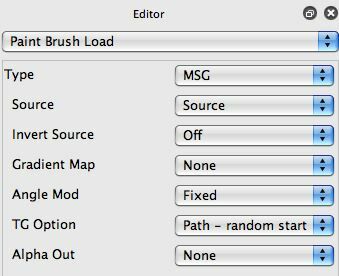 You have additional brush size and orientation modulation parameters in the Brush Modulation control panel that can be used to interactively modulate this maximum brush size when drawing. The MSG TG Option lets you specify how Temporal Generators (TG) will modulate the MSG Live Source Brush internal parameters when drawing. The TG’s can be path or frame time modulated. Path modulation is useful to have the TG’s modulate over the course of a paint stroke (as opposed to modulating over the passage of frame times in a PASeq animation). The MSG Angle Mod parameter allows you to specify a global angle parameter modulator for the MSG preset and is useful to specify the interactive behavior of the MSG Live brush when painting. You could use TG’s attached to the internal processing modules angle parameters but specifying the modulation from the paint synthesizer is a nice shortcut editing feature. Since MSG Live brushes are generated on the fly while drawing (as opposed to being pre-cached like computational source brushes) you can ignore the Brush Modulation control panel rotation controls and specify the brush rotation modulation here. The screen snap above shows the Processor Chain for the simple MSG preset we are using for the MSG Live Source Brush in this tip. It consists of one 3C Abstract CG modular processor. This processor generates an abstract procedural vector color image. The parameter editing list for this processor is shown below. Note that a Temporal Generator (TG) is being used the modulate the random Seed parameter for the processor. 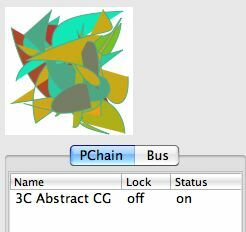 The use of the uniform noise TG modulator means that the random seed for the vector shape generator in the 3C Abstract CG processor is being randomly adjusted each time a new brush image is generated from the MSG preset. This creates a constantly changing procedural texture for the source brush as seen in the paint stroke drawn below with this preset. Typically when creating a new MSG Live Source Brush preset you will want to save the MSG preset you are using as a part of the actual paint synthesizer preset file. 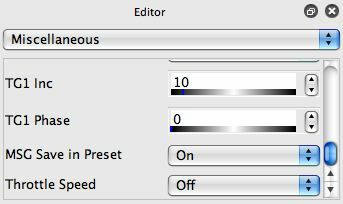 To do this, make sure the MSG Save in Preset parameter in the Miscellaneous control panel in the paint synthesizer (as shown below) is turned on prior to exporting the preset. MSG presets can be used in several different parts of the paint synthesizer in addition to the source brush control panel. This is why the MSG Save in Preset paramter is in the Misc control panel, as opposed to in Source Brush or MSG Brush Load (where it used to be in 3.5) control panels. You can use a MSG preset as a path start generator. This is a way to create fractal imagery from things like IFS (iterated fractal system) MSG processors, where the IFS fractal system is being used to specify the path start locations for paint synthesizer drawing. Or, you can use a MSG preset like this to generate the Path Shape vector path used for drawing. 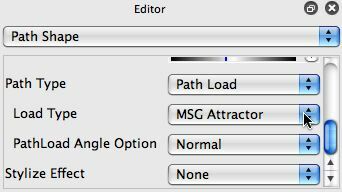 This is done with the MSG Attractor Load Type option when used with a Path Load Path Type option in the Path Shape control panel (as shown below). There is also a MSG Brush Load option, which lets you use a MSG preset to generate the Paint Brush Load image. Recall that the paint synthesizer applies a paint image to a generated brush that is then applied to the actual draw canvas. The Paint Brush Load is a Paint Fill Setup option that allows for a dynamic paint image in this overall paint synthesis process. This is different than the Live Brush Source we have been referring to in the rest of this tip, which is the first component in the 2 part Brush Source – Brush Type brush generation process when painting with the paint synthesizer. You could use the same MSG preset to both generate a live source brush and a live paint load in a special situation, but typically you would only use the MSG preset for one or the other.